The annual Military Family Lifestyle Survey by Blue Star Families itemizes the personal costs of serving a nation. Beyond the overarching challenges of time away from family and living on a military salary, active service members and spouses listed family stability/quality of life, children’s education, impacts of deployments on children, and military spouse employment as the biggest issues in their lives. The survey also highlighted issues involving child care: 72 percent of families said they cannot secure reliable child care, 28 percent of military families lived apart from a service member due to children’s educational needs, and 33 percent said they wanted educators to receive more training on military life experiences. So it’s not surprising that Army Community Service (ACS) plays an expansive and important role in supporting active-duty service members and military families. “ACS provides services from conception to after a service member passes away. Programs span the entire life cycle,” said Doris Tyler, ACS Director at Fort Meade. Through 11 distinct services at Fort Meade, ACS’s offerings range from employment readiness training for spouses and financial education and counseling for military members and spouses, to emergency financial aid, survivor’s assistance, support for new parents, services for special needs family members, and domestic abuse prevention and victim protection. While regulations often limit how much ACS can partner with community members and organizations, ACS programs link with off-post resources and make referrals to community support, as much as possible to meet the needs of service members and their families, Tyler said. Army Emergency Relief (AER) – which provides no-interest loans, grants and scholarships to service members and families in need — accepts donations from the public. Last year, AER provided about $600,000 in assistance to individuals stationed at Fort Meade. Donors may contribute via website at www.aerhq.org. The Military Spouse Employment Program (MSEP) is looking to add local companies to its list of employers that share job postings with MSEP and give extra consideration to applicants who are military spouses. 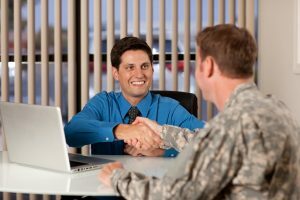 Interested employers may register at https://msepjobs.militaryonesource.mil/msep/home. ACS Army Volunteer Corps Program is looking for companies or other organizations that can offer volunteer service opportunities to the teenaged children of Fort Meade personnel. Teens must complete some volunteer service to graduate from high school but, due to security clearance requirements, employers on-post generally can’t offer those volunteer opportunities. Parents, Tyler noted, often shrewdly encourage their teenaged children to seek out volunteer roles in computer science or other STEM activities. Realizing that ACS programs are essential to the well-being of military members and families, Fort Meade Alliance members are eager to ensure those programs retain their funding and secure community support. In addition, some community members would like to open up additional avenues to support ACS. “ACS staff members have a lot of training and they are the subject matter experts that unit commanders can go to if they have a service member who has a need or an issue. ACS can triage the situation and identify the best resources for that individual,” said Lisa Terry, Manager of Howard County’s Office of Veterans and Military Families. The Fort Meade Region, however, is fortunate to have many, high-quality, community resources that could benefit service members and families from the post, Terry said. Howard County, for example, has employment readiness and financial literacy programs, a volunteer center, and extensive programs and services to support families.